A month ago, I wrote about the e-jeepney and why I became convinced that it was not only a great idea but a bold step in the right direction for the Philippines. Today, I want to discuss its junior in the public transportation sector, the tricycle. There are currently around 3.5 million tricycles all over the country which translates to 45% of all registered motor vehicles nationwide. Tricycles clearly remain to be a significant mode of transportation for the public. They can be found everywhere from cities to remote villages. A tricycle’s advantage includes its small size which is ideal for shorter commute and it’s relatively less cost due to its simple construction. But tricycles have conventional carbureted two-stroke engines which are known not only to be inefficient but also a dirty source of air pollution. Underscoring this observation is the study conducted by the Swiss Federal Laboratories for Materials Testing and Research which revealed that motorcycles spews out 16 times more hydrocarbons and three times more carbon monoxide and other pollutants compared to a car. In April 2011, a pilot project of the government through the Department of Energy (DOE) in partnership with the Asian Development Bank (ADB) was launched to address this particular problem. Twenty electric tricycles (a.k.a. e-trikes) were deployed in Mandaluyong as part of test runs to counter the disadvantages of the conventional combustion engines. From this pilot tests, it was determined that a conventional tricycle which would need 250 pesos of gasoline to cover 100 km in a day’s work would only cost 50 pesos of electricity for the e-trike covering the same distance. This difference in cost incurred by the two types of engines is a manifestation of their respective efficiencies. Electric vehicles are highly efficient enabling 75% of the energy to be used as power while only 20% is effectively used by vehicles with combustion engines. Not to mention the fact that electric engines produce zero emissions - a good thing for the environment. 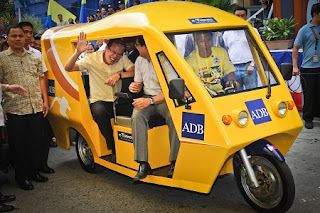 The ADB-DOE partnership would produce 100,000 units of e-trikes in the country by the time the project ends in 2013. This would still come far short of the current number of tricycles in the country. Hopefully the project’s intent of promoting the adoption of electric tricycles as replacement to the current combustion engine tricycles would succeed to create a wide-scale industry. Replacing all conventional tricycles with this new electric type engines will reduce CO2 emissions by 10 million tons per year. Projects such as the e-jeepney and the e-trikes are part of the DOE’s National Electric Vehicle Strategy. The government has realized that oil, which power most of the vehicles used for transportation, will continue to increase in price. The country would find itself in a bind if it chooses to do nothing to address the problem. It cannot opt to counter the price hikes with subsidies it knows it does not have money for. The solution that the DOE is currently pursuing is a prudent one. By moving away from fossil fuels to electric power, the transportation needs of the country will not be in jeopardy when oil prices fluctuate abnormally. The statements given by the energy secretary Jose Almendras to the press citing the agency’s lack of power to dictate gas prices because of the deregulated nature of the industry make it clear how he intends to move beyond the current bickering between the oil companies, the transport sector and the government to what he thinks is the ultimate solution to the oil price problem. He says that moving to electric engines is a strategy that will make the problem go away. Although there is an apparent collusion between the big oil players to dictate gas prices, the world oil markets show why the rise in prices is not country-specific. This does not stop the transport sector, however, from complaining how inutile the DOE has become to watch out for their lot. They do not shy away from demanding price roll backs or if not, a corresponding fare increase. The government is not inclined to increase transport fares which it regulates because of the domino-effect it has on the economy as a whole. This status quo would not change in the near future. Not until the electrification of jeepneys and tricycles has gained a sizable industry share would this topic recede as part of our daily dose of primetime news discussions and punditry. For now, we can only support and wish the best for e-trikes to do well in the future in order to free us from the grip of the oil companies and hazards brought about by climate change. The day will come when cars would have to be converted to electric as well. I welcome it and I hope it arrives sooner.